The top saddle horses were brought out from the breeding farms and show stables to the Worlds Fair. Unfortunately, it was not considered to be the large show that everyone expected. A train from the state of Kentucky arrived in the evening of August 21st . It brought twenty-five carloads of show horses. Ninety-eight saddle horse entries were part of that entourage. Nearly half the Kentucky entries stayed in their home state to compete in the smaller county fairs, rather than make the trip to St. Louis for fear that the prize money would not actually be paid out to the winners. In St. Louis, the Kentucky horses competed mainly with saddlebred horses from Missouri and Illinois. They vied for $4,390 in cash, ribbons, and the American Saddle Horse Breeders $200 cup. The East, as expected, brought no entries. The four-inch-deep mud prevented the saddle horses from showing off their flashy gaits. The draft and coach breeds were not the only ones to have disagreements over the judging. 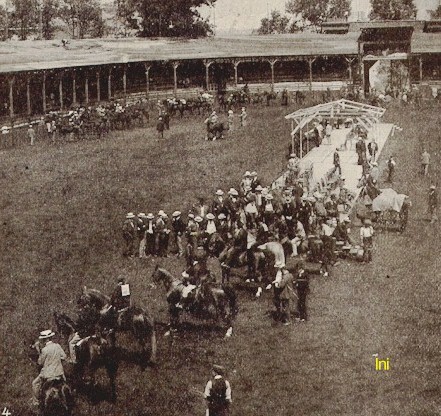 Those of the saddle horses wanted two Missourians to assist C. L. Railey, of Lexington, Kentucky, in the judging. Charles F. Mills, Chief of the Live Stock Department, was hesitant about the decision, but consented to the requests. Railey would have been given extra help if it had not been for Kentuckys Live Stock Commissioner, J. B. Bowles. Chief Mills was told by Bowles that Railey would leave if the other two men entered the ring with him. Therefore, Railey judged alone. Well-known exhibitors from Missouri included Thomas Bass, John T. Hook, Kirkpatrick and Co., S. Y. Sanders, T. B. Small, and J. A. Potts. Bass not only exhibited his own horses, but also those of Missourians J. A. Potts, Thomas Dunn, and Wallace Estill. Gypsy Queen was brought to St. Louis for another successful showing. It was noted that Gypsy Queen had won "every prize in every show in which she was ever exhibited." She was owned by Thomas W. Lawson, a copper millionaire from Boston. She was ridden by Ernest Ball of Versailles, Kentucky. Montgomery Chief, Champion Gaited Saddle Stallion, owned and exhibited by Ball Bros.
Stallion-Four years old or over: Montgomery Chief; Exhibitor Ball Bros., Versailles, KY.
Stallion-Three years old: Emerald Chief; Exhibitor J. Gano Johnson, M. Sterling, KY.
Stallion-Two years old: McDonald; Exhibitor Wallace Estill, Estill, MO. Stallion-One year old: Woodford Chief; Exhibitor Gay Bros., Pisgah, KY.
Stallion-Under one year: Chester Lee; Exhibitor J. W. Garrett, Ft. Garrett, KY.
Mare-Four years old or over: Gypsy Queen; Exhibitor Ball Bros.
Mare-Three years old: Eudora; Exhibitor Gay Bros.
Mare-Two years old: Margaret Weisenger; Exhibitor S. P. Jones, Louisville, KY.
Mare-One year old: Gladys L.; Exhibitor Ball Bros.
Mare-Under one year: Pure Gold; Exhibitor Gay Bros.
Sire & four of his offspring: Highland Denmark; Exhibitor Gay Bros.
Dam & two of her offspring: Emily; Exhibitor Clifton Farm, Pleasant Hill, KY. Stallion & four mares-Three years old or over: Cecil Palmer; Exhibitor Clifton Farm. Stallion & four mares-Under three years: Woodford Chief; Exhibitor Gay Bros. Stallion & four mares-Two years old or older, bred by the exhibitor: Dean Lee; Exhibitor Gay Bros.
Gelding-Four years old or over: Silver King; Exhibitor T. E. Houtchens, Chaplin, KY.
Gelding-Three years old: Gay Lad; Exhibitor Gay Bros.
Gelding-Two years old: Eaglemark; Exhibitor J. W. Garrett. Grade mares-Four years old or over: Viola Chief; Exhibitor Gay Bros.
Grade mares-Three years old: Music; Exhibitor Gay Bros.
Mare or gelding-Harness & saddle, five gaited (section 15): Silver King; Exhibitor T. E. Houtchens. Mare or gelding-Harness & saddle, five gaited (section 30): Jack O' Diamonds; Exhibitor Thomas Dunn, St. Louis, MO. Horses of commerce-Calvary horse: Lode Star; T. E. Houtchins. Mare or gelding-Five gaited horses of commerce: Gypsy Queen; Ball Bros.
Mare or gelding-Three gaited, over 15.3 hands, carrying up to 200 lbs: Harriet; Exhibitor George Watson, New York City, NY. Mare or gelding-Three gaited, 15.2 hands, carrying up to 160 lbs: The Gambler; Exhibitor Ball Bros.
Mare or gelding-Three gaited, 15-15.1 hands, carrying up to 160 lbs: Confidence; Exhibitor Lacey Crawford, St. Louis, MO. Mare or gelding-Three gaited officers mount: Jocelyn; Exhibitor Clifton Farm. References: The Horse Show Monthly, 1904; World's Fair Bulletin, July & October 1904; The Breeder's Gazette, August 31 & September 7, 1904; St. Louis Republic, August 21, 1904. This page was designed by Haley Mahoney and is maintained by Lyndon Irwin.